Psst! Know where you can get cheap coconut water? Warning. May contain coconut water. Take a corkscrew to the coconut holey bit. Stick a chopstick or similar into the hole and wheegie (it’s a word) it about to make a bigger hole. Decant contents into a drinking receptacle through a sieve (repeat a couple of times if you like). 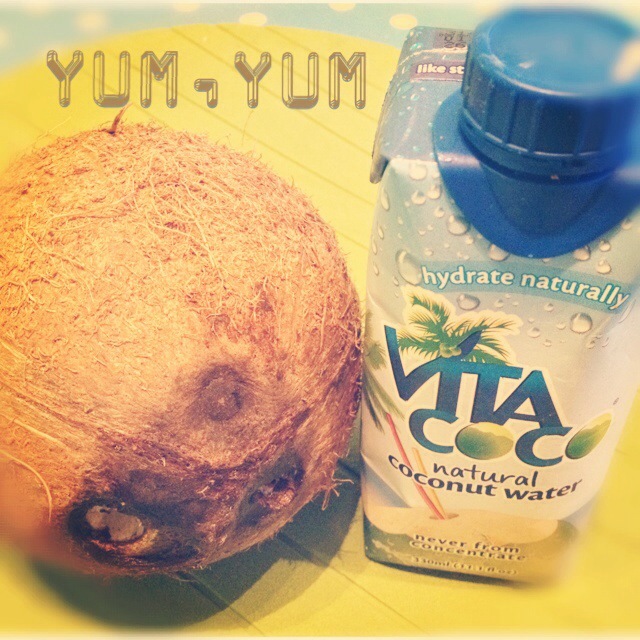 This coconut yielded about 200mls compared to that Vita Coco carton which has 330ml and sells for about €2.50-€3. It’s gorgeous, potassium-packed and super hydrating, but I can’t afford it frankly. Congratulate self on many euros saved, and enjoy rest of delicious coconut flesh. If anyone has any recipes for fresh coconut they’d like to share please do! I also have it on good authority that Lidl will have coconuts for a mere 49c next week. < Surprise. There’s spinach on your window. Also, is that all that coconut water is? I thought it was some new fangled “blend” of wonderfulness. Why isn’t it called coconut milk? Wheegie is more whoosh it round a bit than wedge something tightly. Of course it’s best to tell the older child that it’s coconut juice which improves its attractiveness a gazillion fold. Also, he is more impressed with things in cartons than things just being liquid in a cup.